And yet another trade's algorithm is exposed. The current stock market break is causing a massive spike in volatility. You do not want to be short volatility. Some Credit Suisse quant came up with a trade late last year to go short $500 million in volatility. Ouch. An ETF betting against volatility may have left Credit Suisse with a more than $500 million loss. 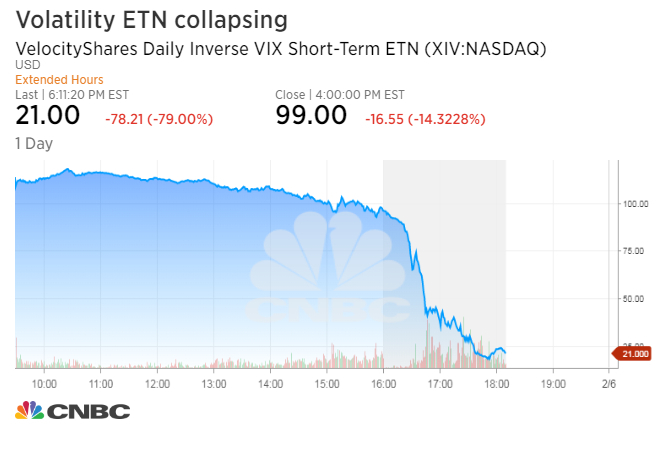 It increasingly looks like the XIV ETF has blown up. It survived regular trading with about a 15% loss and a close at $99 but it appears it was liquidated afterwards, or some very funny business is going on. It's trading at around $15 after hours and a notice on the EFTs website said the net-asset value is just $4.22. If that's all correct, it's basically worthless. It's a similar story in SVXY, which is a similar ETF from ProShares. In the case of XIV, who has the losses? Here is a clue. Numbers published Sept 30 showed Credit Suisse holding nearly 5 million of the shares itself. Those would have been worth $550 million at the open and about $20 million now -- a net loss of $530 million for the Swiss bank. The company reported just $244 million and $303 million in profits in the past two quarters -- so it would essentially wipe out a half-year of gains. And then there are the lawsuits and potential fines from regulators.